There was a time when the average person did what their father and father’s father did for a career. They would work in the same job for 40 hours a week for 40 years, no matter how mind-numbingly boring and meaningless it was. They would go back every day even though they hated it. And despite being a mismatch for their role, they keep doing a half-baked job for years. There was a time when too many people did work they hated, work that didn’t matter and work that they weren’t suited for, because they felt they had no choice. There’s no excuse for that any more. 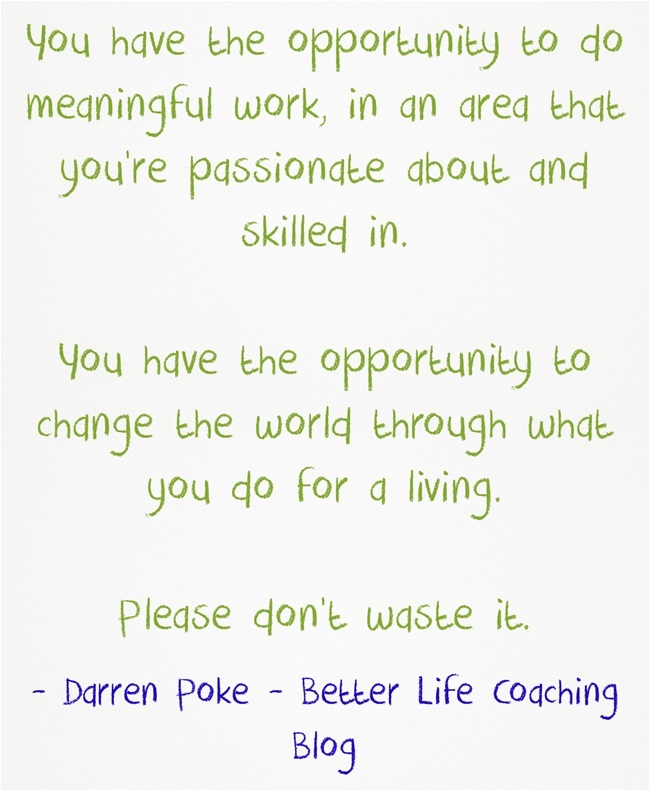 You have the opportunity to do meaningful work, in an area that you’re passionate about and skilled in. You have the opportunity to change the world through what you do for a living. Previous post – Are You Running or Dawdling? Thanks Gerry, yes, those days are gone. You may have never worried about where you would work, but you did have to worry if your work mattered. « Are You Running or Dawdling?